Named after scientist Camillo Golgi, Golgi apparatus (Golgi complex) is membrane-bound sacs organelles that are involved in the modification (and synthesis) storage and transport of proteins and lipids. 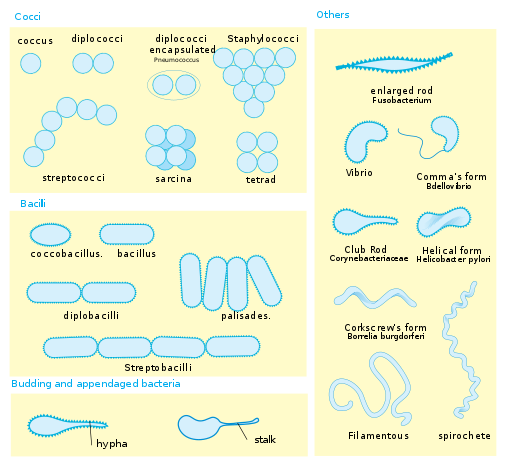 Compared to other organelles, it has a unique appearance made up of pouches that are referred to as cisternae. Inside the cell, this organelle is located close to the endoplasmic reticulum (ER) near the nucleus of the cell. As mentioned, Golgi apparatus is made up of several flattened, stacked sacs referred to as cisternae. However, they can be highly pleomorphic, which means that they can change their shape for their function. Depending on the type of cell, the number may vary from just a few to thousands. 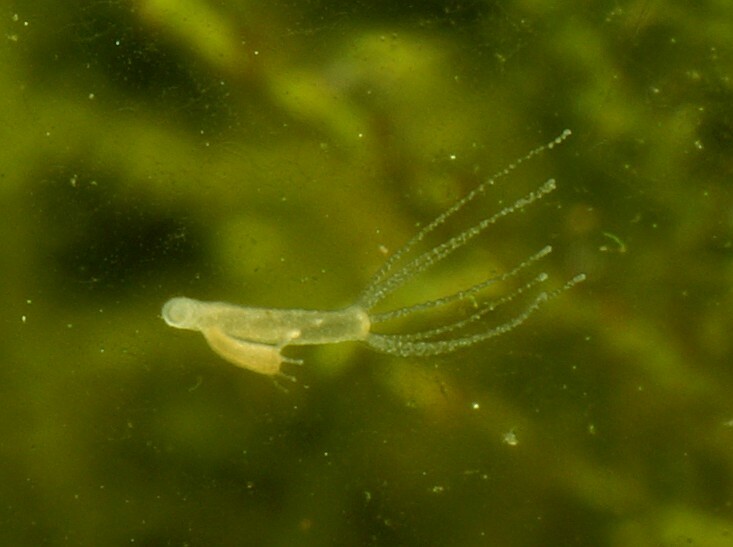 The cisternae are very small with a diameter ranging from 0.5 to 1.0 nm. Each of these is bound by a membrane and is held together by a matrix of proteins. Medial and trans cisternal compartments - they hold various molecules for a period of time. When proteins are produced in the ER, they have to pass through the Golgi apparatus for processing before being released into the cell to be used. Here, the protein released from the ER pass through the cis face to enter the Golgi apparatus. It is important for these molecules to pass through the cisternae stack so that they can be modified and packaged. Different regions have different types of enzymes that act on these molecules to modify them. For instance, these enzymes may either add or remove sugar groups from the proteins thereby modifying them. Once they are appropriately modified, the protein molecules then move towards the trans face to be released into the cell cytoplasm. 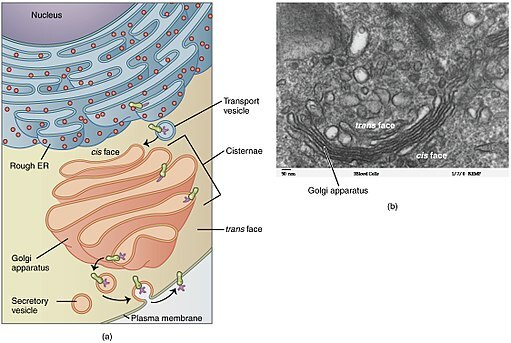 Vesicular Transport Model - According to this model, cisternae are stable compartments through which the protein cargo move. The protein cargo is transferred between the cisternae compartments with the help of vesicle carriers. The carriers transport the protein cargo through the compartments until they are released. Essentially, this process takes place from one compartment to another. That is, the carriers move the cargo proteins from one cisternae to the next. At each compartment, these protein are processed by either adding or removing given groups (sugar, sulfate) and then moved to the next cisternae before ultimately arriving at the trans face to be released. Cisternal Maturation Model - According to this model, the cisternae themselves move thereby transporting the protein cargo. Here, therefore, the protein cargo does not move (or moved by carriers). Rather, they remain intact in the compartment. Enzymes then arrive to the compartment and convert the cis cisterna to medial (or medial to trans cisterna). This process sees the cargo being moved into the subsequent compartments as they have been converted until it reaches the last compartment and ultimately released in to the cell. This process has been observed in yeast where live-cell video microscopy showed what appeared to be Golgi apparatus being converted to another thereby moving the cargo. In the Golgi apparatus, the processing of proteins revolves around the modification of the carbohydrate group on the glycoproteins. The processing process involves changes to the N-linked oligosaccharides that were added while the protein was in the ER. 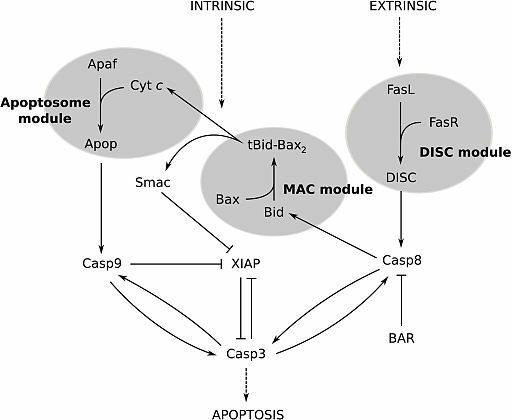 Addition of N-acetylglucosamine phosphates to given mannose residues in the cis face. Removing the N-acetylglucosamine group and retention of mannose-6-phosphate. This process is aimed at phosphorylation of the mannose group, which makes it possible for the mannose-6-phosphate receptor to identify the molecule at the trans Golgi network. Modification of proteins also involves the addition to carbohydrates onto the side chains of acceptor serine and threonine residues of given amino acids in a process referred to as glycosylation. This process also takes place in a sequential manner where single sugar residues are added. With some of these processes, the modification may also involve the addition to sulfate groups on the sugars. Glycosylation is of great importance in the modification process given that it can prevent the degradation of proteins. 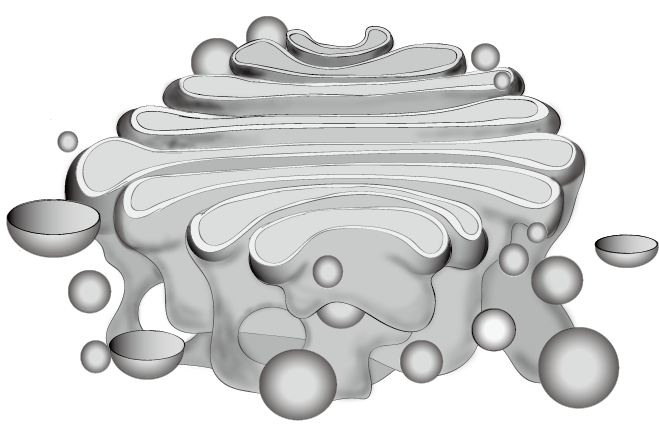 * As mentioned, one of the main functions of the Golgi apparatus is to transport such molecules as proteins and lipids. However, this is only possible when these molecules are properly modified/processed. Processing/modification of these molecules are of great significance given that it helps modify the molecule into the proper structure that will be identified at its destination. It is for this reason proteins are not released from the ER if they are not properly folded or from the Golgi apparatus if they are not properly modified. In addition, additional groups are added onto these molecules to help in their transportation. For instance, a given functional group will be added onto a protein so that it can attach to a carrier and be transported to the right destination. Rothman, J. E. & Wieland, F. T. Protein sorting by transport vesicles.